The process of selecting United Nations secretary-general has often been questioned and criticised. Will this year see some transparency in selection? The world’s most important diplomatic post is up for grabs. The process of selecting the next UN secretary-general (UNSG) has already begun. However, despite the fact that the final selection of a candidate would have wide ramifications globally – the UN faces serious challenges of wars, migration, climate change, famines, proliferation of weapons, issues of discrimination and much else – the process of such selection is not only a tightly closed-door affair among essentially five countries but remarkably the UN Charter itself is rather vague on crucial aspects, like the process and the procedure of selection, timelines of the appointment process, tenure of the UNSG and issues of fair representation. It would appear that the appointment for such a crucial job as delineated by Article 97 of the UN Charter was a hurriedly compiled matter. “Everything will be all right,” said Dag Hammarskjöld, the second UNSG, “when people, just people, stop thinking of the United Nations as a weird Picasso abstraction and see it as a drawing they made themselves.” But the UN remains an abstraction primarily because of the opacity in choosing the UNSG and for two other related reasons: the lack of UN Security Council reform even after 70 years of its existence and the strong control that the P5 members exert in determining the heads of UN agencies. Article 97 of the UN Charter provides that, “The Secretary-General shall be appointed by the General Assembly upon the recommendation of the Security Council.” The UN website states, “Article 97 creates a two-stage process: a recommendation by the Security Council followed by a decision by the General Assembly (GA).” However, the word “decision” may be a misnomer in this context. The UNSC consistently has been recommending only one candidate for the UNSG’s post that the UNGA accepts, except once in 1950 when the matter was put to voting through secret ballot. The only semblance of effective participation from the UNGA is through its supply of the 10 elected members to the UNSC, albeit without their access to the all-important veto power. William Pace, executive director of the World Federalist Movement which also serves as a steering committee member of the 1 for 7 Billion campaign, told Governance Now that for 22 years they have been trying to change the procedure for the appointment of the UNSG. The 1 for 7 Billion campaign, an alliance of about 750 organisations committed to get the best UN secretary-general through a “fair, open, and inclusive process”, has only tasted some success in 2016. It is not clear how the UNSC decides on a candidate since most of the process for recommendation of a UNSG candidate happens in closed, informal meetings the proceedings of which are not recorded as Council decisions. However, there are some normative processes that have evolved over the years without anything being put down as mandatory formalities in the appointment of the UN chief. In 1981, on the suggestion of Ugandan ambassador Olara Otunnu, during the country’s presidency of the Council, the UNSC began a process of ‘straw poll’ wherein the P5 and elected members could indicate either ‘encouragement’ or ‘discouragement’ of a candidate. The practice was further modified a decade later when colour-coded ballots of ‘red’ for the permanent members and ‘white’ for the non-permanent ones emerged towards the later stages of a straw poll. In 2006, the options during straw polls were expanded to three – ‘encouragement’, ‘discouragement’ and ‘no opinion’. A negative straw vote on a candidate by a P5 member essentially works like a veto. However, even though straw polling drew some outlines of the process of selection, the fact that straw polling is an informal process meant an increase in numbers of informal meetings rather than formal meetings where record would be kept on proceedings on the matter. This pushed the process deeper into opacity with information to the outside world coming in through announcements by delegations or through leaks. In case when only one candidate is being considered, the Council goes for a resolution adopted by acclamation after informal consultations with the UNSC members. The GA resolution 51/241 in 1996 affirmed that the process of selection of SG would be made more transparent and the president of the GA would have a greater role in identifying candidates. This, however, has remained only on paper. The exercise of the veto by the P5 members has been a key determinant for selecting the UNSG. The UN states: “General Assembly resolution 11 (I) of 24 January 1946 specifies that the recommendation of a Secretary-General by the Security Council is a ‘substantive decision’ and that therefore the negative vote of a Permanent Member can prevent the adoption of a draft resolution setting out a recommendation.” Many times, popular candidates have been struck down by a veto of a permanent member while others have been chosen only due to the fact that all other candidates have a veto against them. For instance, the first UNSG, the Norwegian Trygve Lie, was selected only because all the others were disqualified by either the USSR or the US. The case of Boutros Boutros-Ghali is well-known; his possible re-appointment in 1996 was vetoed by the US. After Ghali withdrew his candidature, there were a huge number of ‘discouragement’ straw votes and vetoes for all other candidates till Ghanaian diplomat Kofi Annan was chosen. France, however, kept using its veto against Annan till he reportedly agreed to appoint a French national as the chief of the Department of Peace Keeping Operations. In 2006-07, India’s Shashi Tharoor received many ‘encouragement’ votes in the initial rounds of the straw poll but ​received ‘discouragement’ vote from the US and ‘no opinion’ from China in later rounds after which he abruptly withdrew his candidature being aware of the importance of the permanent members’ votes in straw polls. Like for appointment, the term of the SG is also non-prescriptive as per the UN Charter and works only by a precedence of not appointing the UNSG for a third term. In 1946, a UNGA resolution stated that the UNSC may modify the term of future UNSGs. It has become customary for the UN chief to be appointed for a first term of five years that may be extended to a second term. Different SGs have had different lengths of extension, which is decided by the Council rather than the UNGA. There have been various attempts to limit the term of the UN head to one term of seven years. The argument is that this would confer more integrity to the SG who would be more flexible to make the “right” decisions instead of being burdened by the need to placate the P5 to seek re-election. However, this proposal has met with several obstacles. In 1997, a Working Group appointed by the then SG Kofi Annan stated that the option of a single term for the SG would be considered. However, Kofi Annan himself served two terms and the matter was subsequently not given consideration. Though the UN Charter via Article 97 gives no prescriptions for regional rotation of the post of UNSG, the UNGA adopted a resolution based on the conclusion of a high-level working group in 1997, that “due regard shall continue to be given to regional rotation and shall also be given to gender equality”. Member states can be grouped into three broad categories on the matter: those who believe that regional rotation is a principle that should be followed, others who believe that the UNSC is not bound by the principles of rotation but would support wider diversity in the selection process and yet others who support the idea of the best candidate irrespective of the region. In spite of such resolutions supporting diversity, there has been no UNSG ever from the eastern European region nor has there ever been a woman chief of the UN. Till date, there have been only three nominations of female candidates: former Indian diplomat Vijaya Lakshmi Pandit nominated by the USSR in 1953, former Norwegian prime minister Gro Harlem Brundtland nominated by Norway in 1991, and former president of Latvia Vaira Vike-Freiberga nominated by Latvia, Estonia and Lithuania in 2006. Bolstering the lack of the UNGA’s say in the selection of the UNSG is the convention of presenting only one candidate to the GA for their acceptance. Article 97 says that it would be “desirable” for the Security Council to proffer one candidate only for the GA’s consideration. In 2006, the 116-member Non-Aligned Movement (NAM) of which India is a part took the formal position that it was Asia’s “turn” to provide an SG. The same year, delegations in New York met to discuss the Indian approach, which among other things stated that the UNSC will “proffer” two or more candidates for consideration by the UNGA. The P5 which is otherwise adept in striking each other’s candidates down, however, on a rare occasion took a united stand that the UNGA cannot dictate to the Security Council whether it recommends one or more candidates. The elected members also supported this stand. In a letter to the UNGA on June 1, 2006, the SC stated that that the UNGA and the UNSC have different roles with regard to selection of the UNSG and that in the spirit of “transparency” it will keep the GA informed through its president. The NAM did not push the matter for a vote, however. But it was decided that straw polling would take a semi-formal flavour and the decision of the polling would be communicated to the contestants and their sponsoring countries. 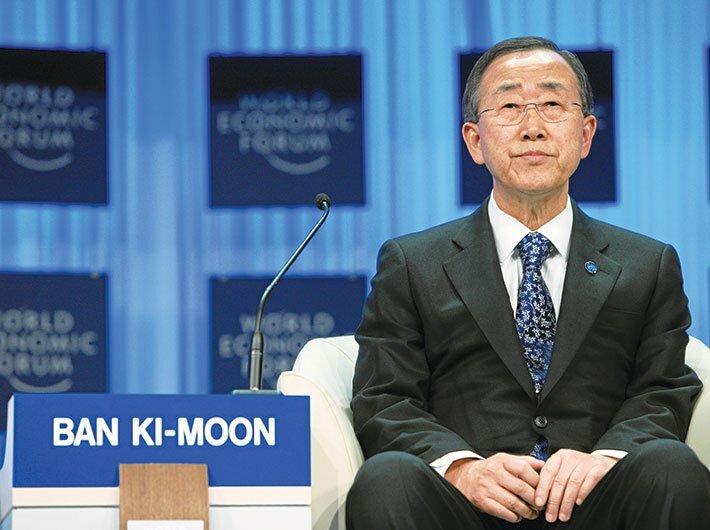 The straw polling under such a format was first held between July and September 2006 with the following candidates: Ban Ki-moon (current UNSG), Jayantha Dhanapala (Sri Lanka), Shashi Tharoor (India), Surakiart Sathirathai (Thailand), Zeid Ra’ad Al-Hussein (current UN high commissioner for human rights), Ashraf Ghani (current president of ​Afghanistan), and Vaira Vike-Freiberga (Latvia). In 2006, there was a Canadian informal proposal as well calling for a reform in the process for selecting the UNSG. The paper proposed that the selection procedure should entail agreed criteria/qualifications of the candidate, a search committee to identify candidates, the presidents of the UNGA and the UNSC through a joint event should explore the perspectives and the position of the candidates, and there should be an opportunity for the candidates to meet all the members of the UNGA. The proposals did not see the light of day because apart from India, Canada and a few other delegates, no other member state pushed much for the proposal to become formal. A UNGA resolution the same year, however, for the first time, stated that the candidate must show a commitment to the principles in the UN Charter and also prove “extensive leadership, and administrative and diplomatic experience”. In 2009, an important effort by a joint investigation unit (JIU) began – an evaluation of the selection of the UN chief and the executive heads of other agencies in the UN system. The JIU evaluation concluded that there was a general agreement among the member states for more transparency in the process and also the increased involvement of the UNGA early on in the process. The report also concluded that many delegations support the idea of an interaction of the GA with the prospective candidates in the form of hearings. In 2010, the Delphi Symposium with 21 participants comprising UN officials, former ambassadors and former foreign ministers was held in Greece that delineated the qualities of a UNSG and the participants reiterated the view that a strong SG must be “even demanded” because in the past member states, particularly the P5, have been reluctant in the appointment of a strong and independent mandate-holder. The participants also advocated the forming of an international search committee to scout for the best candidates to identify and interview them. A UNGA resolution 69/321 was adopted on September 11, 2015, upon pressure from active civil society groups, which for the first time mentioned some important attributes to the process of selecting a UNSG. For the first time in the history of the UN, the process of selecting the UNSG started so early. Also, for the first time the UNGA is holding informal dialogues with candidates as stated in the UNGA resolution of 2015. The NAM wanted to put the resolution on vote because of its concerns on a number of issues, including the push for multiple candidates, but the resolution was finally adopted by consensus. Russia and the US did not agree to put in the clause of multiple candidates in the resolution. Also, the attempt to put in language to limit the SG’s term of office to a “single, non-renewable period of seven years” was opposed by many member states. The US and Russia, usually ideologically opposed but in this case united, have made statements in favour of status quo for the appointment procedure and so has China. France has not expressed any strong opinion at this point while the UK seems to be the only state favouring a reform in the UNSG selection process and deadlines and timetables for the same. Ambassador Matthew Rycroft (UK) called for an open Arria-formula meeting, clear deadlines and a date by which the selection process should happen. These are long overdue discussions on big reforms within the UN. Some reforms that are seen in 2016 have come about due to campaign groups particularly, the 1 for 7 Billion campaign, the Accountability, Coherence and Transparency (ACT) group which consists of 25 member states and The Elders, a group of global leaders promoting peace and human rights, which has members like Gro Harlem Brundtland and Mary Robinson, former president of Ireland and former UN high commissioner for human rights. There are also two ongoing active, separate campaigns to promote a female secretary-general – the Colombia-led initiative called ‘Group of Friends for a Woman Secretary-General of the UN’, with Japan, Germany and a quarter other member states as signatories, and Campaign to Elect a Woman Secretary-General. The 1 for 7 Billion campaign is urging for the positions and the qualifications of the candidates to be advertised in all countries with proposed candidacies coming from all member states as well as from parliaments and civil society organisations. The Elders and the 1 for 7 billion campaigns have also focused on the undesirability of candidates promising to individual countries on senior appointments during the course of their campaign since this is “clearly contrary to the spirit of the Charter”. Both the campaigns have also argued that the term of office should be limited to a single term “in order to strengthen his or her independence and avoid the perception that he or she is guided by electoral concerns”. This issue, along with the issue of proposing multiple candidates to the UNGA by the UNSC, has been the most contentious issue for this election. As proposed by the UNGA resolution of September 2015, eight candidates held informal dialogues with the UNGA on April 12, 13 and 14. The reform-minded UNGA president Mogens Lykketoft presided over the two-hour discussion time given to the candidates who fielded questions from member states, civil society and the public. The questions and statements revolved around the usual suspects of topics: reform of the UNSC, ongoing wars, migration crisis, gender parity within the UN system, SDGs, climate change especially in the context of small island nations, etc. The candidates for the first badge were Igor Lukšić (former prime minister of Montenegro), Helen Clark (former prime minister of New Zealand and present administrator of UNDP), Irina Bokova (director-general of UNESCO), Antonio Guterres (former prime minister of Portugal and former UN high commissioner for refugees), Danilo Turk (former president of Slovenia), Vesna Pusić (foreign affairs minister of Croatia), Natalia Gherman (minister of foreign affairs of Moldova), and Srgjan Kerim (former foreign minister of Macedonia). The name of Angela Merkel, current chancellor of Germany, has also been floating around though she has not announced her formal candidature yet. She, however, might be too strong a personality for the P5’s liking. The best bet for the next UNSG should perhaps be placed on an east European woman candidate. The UN, however, in the past has been known to spring up many surprises in its selection of its chief. “Though the veto members don’t want to admit it, there is a new procedure in place and hopefully it will result in a fundamental change in how the SG is appointed,” Pace said.